DEL-BOM #10 on sale now. 6E has gone thrice daily on Del-Atq and v.v. and now UK going double daily. Good for pax using this route as so many more flights to choose from. On a different note flew Del-Bom with UK in Premium Economy last week. Meal standard seem to have dropped in comparision to previous flights in Premium on the same route. No dessert and No Appetizer on the meal tray. I was on the 1745pm dept. Good Starbucks coffee. Vistara's first A320NEO, to be registered VT-TNB. Vistara, the TATA-SIA joint venture took delivery of its 1st Airbus A320neo and 14th aircraft in fleet today. The aircraft is registered VT-TNB. The airline had selected BOC aviation to lease 20 aircraft, 13 A320ceo and 7 A320neo in second half of 2014. The airline which was running a social media campaign with hash tag #NotJustAnotherNeo announced the new features of the aircraft. Vistara’s A320neo features mood lighting, something which this blog had speculated on 20th March 2017. The pre-defined lighting scenarios for different phases of flight use a carefully selected palette of colours and dynamic transitions to enhance the ambience and overall experience in the cabin. Besides, the airline has also introduced new boarding and landing music in genres including blues, jazz and carefully curated soft rock instrumentals that complement the atmospheric mood lighting. The other changes include new seat bottom and seat back design, softer cushion and Vistara and Airbus A320neo logo on the underbelly of the aircraft. The in-cabin enhancements have been a result of extensive customer and frequent flier feedback. Business class and Premium economy class cabins feature a Aubergine and Gold color scheme along with softer seat leather and cushions. Vistara has added a new A320NEO (its first), to the fleet today as VT-TNB. Thanks to you Sir, we know more about tomorrow...today itself. Great perspectives, which keep us rivetted to your articles. Vistara has added a new A320NEO to the fleet today, as VT-TNC. Vistara on Tuesday said Leslie Thng will succeed Phee Teik Yeoh as its chief executive officer from October, subject to government approval. "Thng, who started his career in SIA, has held many senior positions in the airline, and has significant experience across international markets and various businesses. Prior to being appointed chief commercial officer for Budget Aviation Holdings (BAH, a SIA owned holding company), he was chief executive of SilkAir. Leslie will lead Vistara in its next phase of growth, including international operations, building on the solid foundation and momentum achieved by the airline under the leadership of Phee Teik Yeoh," Vistara said in a statement. "Yeoh, who has been an SIA veteran, is credited with successfully leading Vistara... since its establishment, overseeing its launch and rapid growth starting its first commercial flight in January 2015," the airline added. Vistara Airlines on Tuesday launched its check-in facility at the New Delhi Airport Metro Station, where passengers can have their luggage checked-in and collect boarding passes. “Our partnership with the Delhi Metro Rail Corporation (DMRC) and Delhi International Airport Ltd. (DIAL) adds to the multiple check-in options we offer to our customers. This will allow our customers to breeze through the check-in process at any of the Airport Express Line Metro Station,” Vistara CEO Phee Teik Yeoh said. With this service, the passengers’ checked-in luggage will be transferred to Indira Gandhi International Airport Terminal 3. Passengers can check-in 2-3 hours before the departure of the flight. DMRC Managing Director Mangu Singh said this service is not only instrumental in its contribution to keeping the city decongested, but also acts as a reliable mode of transport. “Especially when one is travelling to the airport, one keeps a buffer time of at least one hour. This service will be very very important in making the commute to the airport more reliable,” he said. Qatar Airways on Tuesday today entered into an interline partnership with Vistara, under which customers of the two carriers will have seamless travel to and from India to over 150 destinations. The partnership is effective from Monday, Qatar Airways said. "This exciting new partnership with Vistara will bring enhanced connectivity and increased convenience to our passengers travelling within India on an expanding full-service premium carrier. The Indian market is very important to us. This new partnership expands Qatar Airways' presence in India and reinforces our commitment to this market," Qatar Airways Group Chief Executive Akbar Al Baker said. Given what is happened to Qatar in the US where AA, DL canceled their interline agreements, I wonder if Qatar had to give favorable rates to Vistara? I bet they did. Has 9W cancelled their interline with Qatar? Full Service Carrier Vistara announced the launch of Amritsar and Leh to its network effective March 2017. The TATA-SIA Joint Venture, which will celebrate two years of operations next week has a fleet of 13 Airbus A320 with 7 A320neo on order, delivery of which is expected to start from April’17. The airline which has been struggling with lower load factors as compared to competition flies to 18 destinations at present. The airline will suspend operations to Varanasi from 1st March. Varanasi was the 12th destination for the airline and was launched in October 2015. Flights to Amritsar will be operational from 1st March, while Leh will be its 19th destination effective 25th March. Varanasi may return once the runway resurfacing project at the airport is completed. Also, to facilitate Mumbai-Amritsar's addition - 1 daily Mumbai-Kochi is axed. Vistara has added a new A320NEO to the fleet, as VT-TNE. Japan Airlines (JAL) and Vistara on Thursday signed a Memorandum of Understanding (MoU) to pursue commercial opportunities that combine the synergies of both airlines with the aim of providing greater convenience to their joint customers travelling between India and Japan, and through Japan to points beyond. This mutual understanding between Japan Airlines and Vistara will help the two airlines pursue significant cooperation in the near future, such as codeshare, frequent flyer partnership as well as other operational arrangements, allowing them to leverage each other’s network, expertise and assets, subject to necessary approvals from authorities. Vistara and Japan Airlines entered an ‘Inter-Airline Through Check-In’ (IATCI) partnership earlier this year enabling customers to enjoy a seamless 'Through Check-in' facility, when connecting to or from a Vistara flight in India and more than 50 countries across the globe on Japan Airlines’ network, using a single ticket. “The strengthened partnership with Vistara represents a significant milestone for the two airlines to provide customers better access to destinations between and in Japan and India, and we believe it will open up commercial opportunities on the two airlines’ networks,” said Tadashi Fujita, JAL Executive Vice President. In line with the rapid economic growth in India, demand for air travel between Japan and India has grown tremendously over the recent years. JAL operates a daily non-stop service between Tokyo (Narita) and Delhi, with plans of strengthening its presence in the country through a suitable partner to help boost connectivity between Japan and India, connecting through Delhi. Vistara, the airline run by Tata SIA Airlines Ltd, has advanced its plane deliveries by three months that will help it launch international flights after March. Vistara currently has 16 planes and was scheduled to get its 20th plane in June. That will now join its fleet in March, the airline’s outgoing CEO Phee Teik Yeoh said at a press conference on Thursday. The airline has leased another two additional planes that will join one each in May and June after these 20 planes come in. 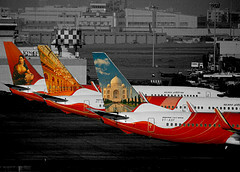 Under India’s rules, a local airline needs to have at least 20 planes before starting international flights. The airline hasn’t announced its wide-body fleet plan yet and declined to elaborate on Thursday as well. Wide-body planes with two aisles are typically used for longer flights. “We are very close. There are many exciting points (international cities) that we should be operating into. At the same time, we are also very excited about the possible orders that will be required to support aggressive plans overseas,” Yeoh said. Passengers on full-service airline Vistara will get to check in 5 kg more baggage in all classes if they book tickets through its website, Tata SIA Airlines Ltd that runs the airline said. All domestic airlines currently offer 15 kg of free checked-in baggage. The next 5 kg is charged at about Rs1,400, going up to about Rs8,000 for 30 kg. Only state-run Air India offers 25 kg free baggage irrespective of how the ticket is booked. Vistara will also allow one free change or cancellation within 24 hours of booking (as long as travel is at least seven days in the future), complimentary fast-track priority handling at the airport at dedicated counters (for check-in, baggage, and boarding), and double air miles or points earned on flights. Charges for cancellation and name change can be as high as Rs3,500. “Booking directly with Vistara offers customers a number of advantages, such as lower fees, assured communications and notifications regarding their travel, the ability to pre-select their seats, along with exclusive offers such as upgrades at attractive rates and other ancillary products and services to help customers enhance their journey,” Sanjiv Kapoor, chief strategy and commercial officer, Vistara said in a statement. Vistara said it has sought aviation ministry approval to start international operations in May next year, by which time it expects to meet the 20-plane eligibility norm. "As part of the preparation, we have also advanced our aircraft deliveries and expect to receive our 20th aircraft by March 2018. In addition to our initial order, we are leasing two Airbus A320neos, which will arrive by June 2018," the airline said in an email. "The launch of international operations will be through Airbus 320 aircraft and the airline, in the first year, will connect destinations within four hours of flying distance from India," said a person aware of the proposal. "Mediumhaul and long-haul aircraft will be added subsequently, during the second and third year of operations." Vistara will consider the Calicut International Airport in Karipur among others for its international services which will be launched in March 2018. The company has approached DGCA seeking permission to conduct economic survey ahead of the new service in Kozhikode-Gulf region. The company will evaluate the scope of the profit and loss of new services. Vistara aims to start airline services to Dubai, Sharjah and Muscat. It is learned that the seats allotted to Gulf-based airline companies, as per the agreement between union government and the Gulf countries, has already been filled. Hence, it is not possible for these foreign companies to start new services in India. Presently, Vistara has 16 aircrafts in their fleet. The company is expected to get the newly ordered aircrafts within June 2018.But the company is trying to get it by March to start the service. The company is also planning to take four aircrafts on lease from Singapore Airlines. The new services will be included in the summer schedule which commences from April. In the initial phase, the service will be operated to Gulf countries and West Asian countries. Thus, the company is studying the feasibility of international services from Kozhikode. Vistara has added a new A320NEO to the fleet today, as VT-TNF. Vistara, which plans to spread its wings to the international skies from the next year, will soon have a mix of female and male cabin crew on its flights. "As an equal-opportunity employer, it has always been part of our plans to have mixed cabin crew," he told PTI. "It (hiring of male cabin crew) is also good timing from a service delivery perspective as we gear up to start our international operations soon," the official said. "As an equal-opportunity employer, it has always been part of our plans to have mixed cabin crew,"
Then why didn't they just have them from the beginning? It's their fourth year of operations! Typical PR guff. I would second that. Its a way of creating free buzz and getting back at 6E as they dont have male crew. Which in my opinion is ridiculous. Vistara's Thng, at the conference, also said the group would lease five more A320neo aircraft by June 2018. Vistara currently has a total of 17 aircrafts on lease including four of the fuel-efficient A320neos. Is Tehran to be their first international destination? Vistara, the joint venture between the Tata Group and Singapore Airlines Ltd, is in talks with Airbus SE and Boeing Co to buy jets worth $8.5 billion as the carrier seeks to tap India's growing middle class, according to a Bloomberg report citing people familiar with the plans. Vistara, majority owned by the Tata Group, is seeking to buy about 50 narrow-body jets, typically used for shorter routes, and up to 10 wide-bodies, said the people, who asked not to be named for discussing private negotiations. A final decision is likely by June, one of the people said. A representative for Vistara didn't respond to Bloomberg's requests for comments. An Airbus spokesman said the company's discussions with customers are confidential. A Boeing spokesman declined to comment. Competition on the smaller aircraft pits the Airbus A320neo against Boeing's 737Max, the people said. On the larger planes, Airbus's A330neos are vying with Boeing's 787 Dreamliners. Really A330NEOS?? Not the A359? I would think A359 would be a better fit or the 788/789. A330 would not be able to fly nonstop to US nor India-OZ (I think). Vistara has added a new A320NEO to the fleet today, as VT-TNH. Vistara has added a new A320NEO to the fleet today, as VT-TNI. Vistara has added a new A320NEO to the fleet today, as VT-TNJ. Vistara on Wednesday said it has received its 20th aircraft, and seventh Airbus A320neo, marking an important timeline in its ambition to begin global operations. "With this milestone addition to its fleet, Vistara completes its initial aircraft order as planned at the early stages of setting up the airline. Vistara will use the new aircraft to increase frequencies on existing routes... while gearing up to start international operations soon," the airline said. “This is not just another addition to our fleet, but a landmark one that signals Vistara’s arrival on the global map and marks the beginning of our next phase of growth," said the airline's CEO, Leslie Thng. The airline is expected to add two more aircraft to its fleet by May, and start global operations in the second half of the year. Vistara has introduced its first male cabin crew to the skies. The crew is a mix of an experienced and new team who are going up in the air following a rigorous three-month safety and service training program. The company also unveiled the crew’s uniform which was created by celebrated designer label Lecoanet Hemant. It features a light lavender-coloured shirt, along with midnight blue tailored-fit trousers and a classic, sleeveless Mandarin-collar jacket with a pale gold pocket square. According to the airline, the new uniform complements Vistara’s “unique, elegant, and practical female crew uniform”. A second and third set of all-male crew is currently in training and are soon to join the first team.